Allison is growing up. This week we were able to attend her Young Women in Excellence program. It is amazing to me all that she is becoming. Saturday morning she woke me up bright and early in the snow to drive her and a friend up to Draper as our temple was closed to do baptisms for the dead. And then combined with that feeling of love and pride I have in her is that feeling of exasperation as she gives me grief that I made meat loaf for dinner or watching her trying to boss around Robyn. Robyn has been the crafter this week. She has been learning about the Civil War in school and we got to make a puppet at home together. 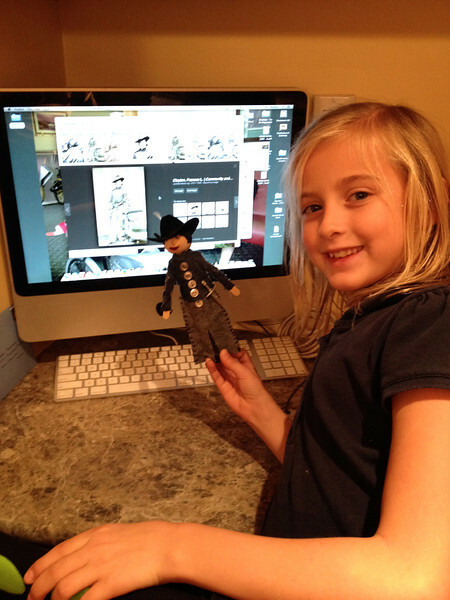 She wanted to make a puppet of a woman soldier and found the story of a woman who dressed up as a man so she could fight, named Frances Clayton. She was pretty pleased with herself. We have resorted to pushups for tattling in our house. Robyn should have some amazing triceps in a few weeks. Spencer found out this week what happens when you work with a partner on school project and they don't do their half of the assignment. Not a happy experience. So he has been working away this week at getting on top of things there. He got to help two families move this week along with Jeremy and Allison. I love when he can go do active service as he is happy to do it, it tires him out and he feels good about himself. Jeremy said that watching the teachers move things though is a case of constant re-directing their attention to the job at hand. They are willing but easily distracted. Robyn helped me Saturday morning to clean one of the moving families' houses. She was busy singing "A spoonful of sugar" and working away. That lasted for 15 minutes and then she spent 45 minutes pretending to be a dog until it was time to go. Baby steps. Spencer had a piano recital this week. He was feeling pretty cocky about how well he did until the boy after him played John Schmidt's Waterfall at high velocity. Helped keep his feet on the ground. Saturday I got to have my annual Christmas shopping day with my friends. And once again I forgot to take pictures. But we caught up on each others' kids and families, ate cheesecake, oohed and awed at all the fancy stores and had a great time spending time together. I realized that we have known each other now for 15 years. There is a bond of having little kids all together that just stays with you. And Jeremy and kids enjoyed a day of eating leftovers, watching TV and hanging out. Way to go Spencer! What a great recital! And I love your shopping day, I envy your tradition. Hearing how Robyn helps and doesn't help makes me giggle because it is the girls incarnate. And oh Allison, what a incredible young lady you are becoming.